At the 2016 Detroit Auto Show, Porsche took the Boxster legacy a step ahead by unveiling two of its models, Porsche 718 Boxster 2017 and Porsche 718 Boxster S 2017. The model gets a wider stance to house the aggressive engine while the interior gets an updated look featuring clean and spacious interior. 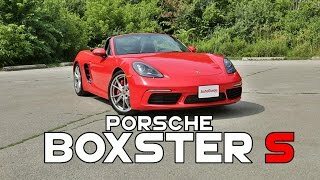 Let us have a look at the review of Porsche 718 Boxster S 2017 to know in detail about it. The interior of Porsche 718 Boxster S 2017 is undoubtedly a treat for luxury riders. The model is housed with a cleaner dashboard, an updated steering wheel featuring the Porsche entity in its center while the instrument cluster behind too gets a new look. The major pros coming for you all with this model is the all new Porsche Communication Management system. The integration comes standard with the model and includes cellphone preparation, audio interfaces and a throbbing 110 watt Sound Package Plus. There will also be a navigation module with voice control to assist you throughout your drive. The metallic accents over the dash, steering wheel, air ducts and the door panels add commendably to the gorgeous arena. 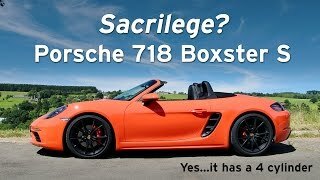 Thus rounding up the interior details of Porsche 718 Boxster S 2017 I would say it is comfortable, spacious and tech oriented gorgeous piece of engineering and designing. 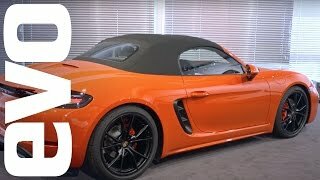 The exterior of Porsche 718 Boxster S 2017 for once will remind you the traditional Boxster but a closer inspection will bring out some changes. Starting with the front fascia we have a newly designed lower section featuring two wider side air intakes beneath the thin LED daytime running lights. The latter was previously integrated in ducts. The new LED headlights portray eye-like figure while the hood gets a beefier look. It isn’t just the hood getting beefed up but also the side sill add to the aggressive glory with this new look. Moving towards the rear end you’ll notice the standard 19” wheels (optional 20”) fitted beneath the perfectly carved wheel arches. Reaching the rear fascia we have a muscular body. At the end of the deck lid and close to fenders the bulged up LED taillights receive black finishing around. The latter doesn’t end there and further connects the set of taillights and feature ‘Porsche’ lettering in white on them. 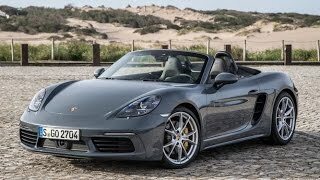 Thus rounding up the exterior details of Porsche 718 Boxster S 2017 I would say, its muscular, elegant and looks ferocious. Powering the Porsche 718 Boxster S 2017 is a 2.5 liter four-cylinder Boxer engine generating total output of 350 hp and peak torque of 419 nm paired to six-speed manual transmission as standard while the PDK transmission comes as an option. The top speed of Porsche 718 Boxster S 2017 touches the mark of 177 mph and can sprint from 0-60 mph in just 4.0 seconds with the Sport Chrono Package and in 4.4 seconds and 4.2 seconds with Manual and PDK respectively.